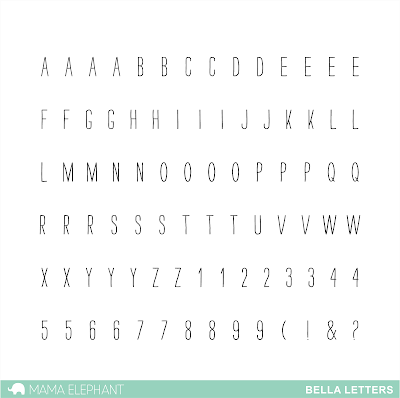 Customize any project with this great alphabet set! Since they are on the smaller scale, we were able to squeeze in a couple of extra letters! Angela made a card for Kryssi's upcoming birthday! She put together Kryssi's name with the Bella letters and embossed the name in silver. 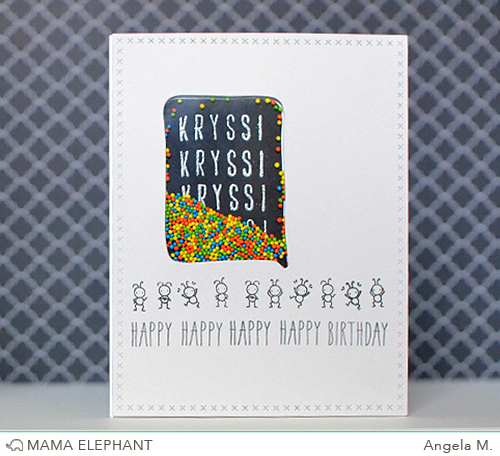 The sprinkle candies makes a fun party shaker card! Are you getting cavities from all this sweetness yet?! Such elegant, precious letters! Great to use them for festive occasions. I love that letters and numbers are included! I LOVE alpha sets with multiple letters! Can't wait to see the Small Talk set too! Those little ants are the cutest! So sweet! I love these letters. Great alpha stamp...simple for all occasions. LOVE those cute tags using the playful pups stamp set!!!! Sold! Need that alpha set. Just want to know the height of the letters? Sweet again!! !Thanks Mama Elephant ! I like these letters. I like that they are thin and not chunky. Love the projects, especially love the tags. They are just too cute. Love these smaller, thin letters! They are going to be so useful. Those tags are adorable! Oooh, I'm a sucker for alphas!!! Love the puppy with the letter in his mouth. the letters are great too. awesome letter set... love how small they are.. So so sweet! I want that adorable alphabet! Yes, my teeth hurt LOL. These ARE sweet! Oh my goodness, that stamp set is a MUST have!!!! I don't have a ME alpha set; I need that one! Those pups are adorable! And those itty bitty bugs! Love the diagonal cuts on the tags. LOVE, LOVE the Tags a lot dies! Tags are such a versatile piece. And, the puppies...too cute!